Pet peeves: I can't stand people that are lazy. Go out and get what you want! Don't complain about it and do nothing and expect it to happen. I also hate when people cut me off while I'm talking. Please let me finish what I have to say, it may be important. I am extremely proud of making our S.W.A.T. team. I had to work extremely hard to lose a ton of weight to be physically able to even try out, much less do well enough to make the team. I was one of the youngest and least experienced people to ever make our S.W.A.T. team. My hero is my stepfather, Tim. Tim met my mother shortly after my parents separated. My whole life he has always been a steady father figure and an amazing role model. He taught me the value of hard work and how to be a humble man. When I met Tim at seven years old, he had nothing. My mother and him worked diligently and started a company from nothing and now want for nothing. Don't get me wrong, they aren't billionaires, but they pretty much do what they want when they want. Tim works many long hours and long nights to provide an amazing life to our family. The best part about him is you will never hear him brag about it. There is a song written by Brad Paisley that makes me think of him and brings tears to my eyes when I hear it. It's called "He Didn't Have to Be." It talks about how his stepfather was a great father to him and he hoped that he can be half the dad that he didn't have to be. That describes how I feel about Tim. A picture of my kids because I will miss them terribly. A Kindle with lots of books for entertainment. A hammock so I can have somewhere comfortable to sleep. I feel like I can relate to Malcolm from Season 25 the most. I feel like I'm young and athletic like he is and that I could do well in the challenges, making me an asset to my team in the beginning. I also feel like I can play the game strategically like he did, helping me run deep in the game. I work in a profession that requires me to be able to talk to any type of person through all walks of life and be able to relate and convince them to do things that I may need them to do. 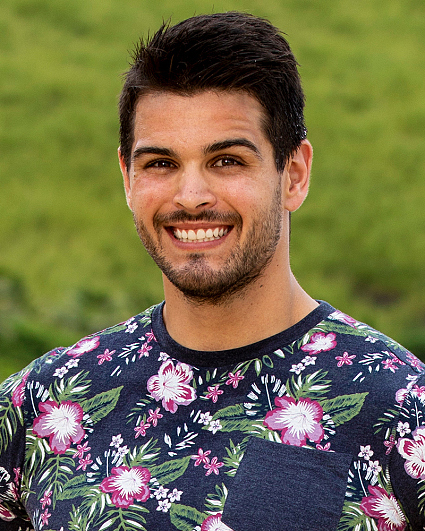 Malcolm was such a likeable person that he was voted off because three other contestants knew they wouldn't beat him in the final vote. I feel like I'm a very likeable person. I am able to make friends and relate to people anywhere I go. My primary motivation for being on the show is to win. A million dollars would be a great way for me to provide a great life for my children that I wouldn't be able to do otherwise. My secondary motivation is my desire to compete. I love competing and I love winning. I haven't been able to compete at a high level since I played college football and I would love to be able to compete against other gifted men and women. I believe that I could be the winner for multiple reasons. I have a strong desire to win. I always want to win at absolutely everything I do. Whether it be checkers with my girls or just trying to be the first one to a call for service at work. I always want to be first. I have a strong work ethic. When I put my mind on something and decide that's what I want, I go and get it. Prime examples would be making our S.W.A.T. team. Prior to trying out, I was a very overweight guy. I decided that I wanted to be more than just a regularly everyday beat cop and I did whatever it took to do it. I changed my diet drastically, I worked out every single day, and I went to the track and ran sprints 2-3 times a week. Lastly, I'm very good with people. My career requires me to be able to talk to people all day. Everything I do at work requires interaction with people, and more importantly people who are typically either angry or distressed. I am very good at talking to people and convincing them to do things that they typically wouldn't want to do. I am quite skilled at calming people down when they are upset or angry.